Product #21267 | SKU 203962 | 0.0 (no ratings yet) Thanks for your rating! 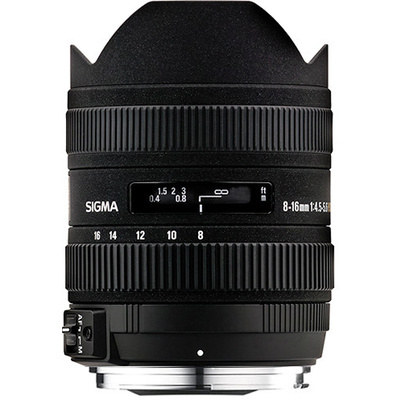 The Sigma 8-16mm f/4.5-5.6 DC HSM is an ultra-wide zoom that has a 35mm equivalent angle of view of a 12-24mm lens when used on DSLRs with APS-C size image sensors. This lens is constructed with 15 elements in 11 groups which help deliver incredibly sharp image captures. Sigma's FLD glass elements, equal to fluorite glass, correct for colour aberrations and aid in delivering beautiful high contrast images. The lens has a minimum focusing distance of 24cm allowing you to emphasise the subject by creating exaggerated perspectives. It features a compact construction with an overall length of 105.7mm and a maximum diameter of 75mm. This 8-16mm f/4.5-5.6 super wide angle zoom is perfect for shooting landscape photography, architecture, building interiors, photojournalism, wedding photography, group pictures and a wide variety of other shooting opportunities you may encounter. This is a DC series lens designed exclusively for use with Sony/Minolta DSLRs with APS-C size sensors.